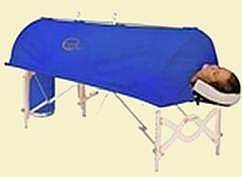 For Massage Therapists & Spas"
Turn your massage table into a full-service professional massage table Day Spa with the Steamy Wonder Spa™ portable steam sauna. The Steamy Wonder Spa™ converts an ordinary massage table into a full-service spa room. By owning a Steamy Wonder Spa™, you will separate yourself from all other massage therapists in giving healing treatments, by raising the level of healing treatments. This can result in more satisfied clients and more referrals to you. 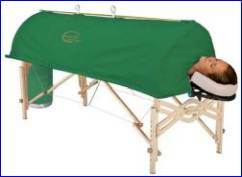 Our system allows your clients to lie down comfortably without leaving your massage table. During the treatment, their head remains outside allowing the lymphatic system and organs to heal themselves. No plumbing or room redesign is necessary. All you need is a standard electrical outlet and your massage table. Our lightweight steam canopy can be assembled or disassembled in just a few minutes, allowing you to maintain the versatility of your treatment rooms. Its portability also allows you to take your services to your client's home, or have them relax in your facility. The Steamy Wonder Spa™ uses a patented heat-circulation design that provides a soothing flow of steam and an even distribution of heat within your steam canopy. An entire treatment uses just a few cups of water, and your clients keep coming back for more. See what is included in the The Amazing Steamy Wonder Spa™ Package. ★ Who uses Steamy Wonder Spa™? Massage therapists, massage training schools, estheticians, and spas. ★ Ayurvedic Steamy Wonder Spas have been used around the world for 20 years. Some of the top Ayurvedic physicians and schools use Steamy Wonder Spas™. Nearly 7,000 Steamy Wonder's have been sold worldwide. ★ Steamy Wonder Spa™ created the healing treatments for sore joints, arthritis relief, fibromyalgia, weight loss, and lymphatic drainage. 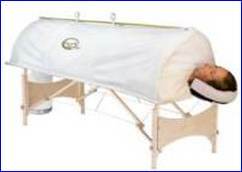 ★ Many Hospitals use the Steamy Wonder Spa™ after administering chemotherapy. Trillium Herbal Company, Inc is the creator of the Steamy Wonder™ Organic Body Treatment Products - phone 1-800-734-7253.